Mobile apps are taking over the web and we see more companies directing resources mainly for the use and support of native mobile apps versus traditional websites and mobile web. With mobile internet set to exceed desktop usage on a global scale, the shift becomes even more feasible for developers and companies that build apps. Twitter, with a reach of over 255 Million active users (Source) – of which 198 Millions are mobile users (77.6%), is a ripe and rich target for mobile app developers who need to reach a fairly trendy and tech savvy audience. Leveraging Twitter’s visibility to a mobile based audience is going to prove vital for your app marketing campaign. Twitter just announced a brand new approach to promoting apps: A mobile advertising suite that allows companies and mobile app developers to pitch apps via promoted tweets. Quite similar to Google’s introduction of their new promotional links in searches which, according to some, are barely distinguishable from “real” search results (even though there are different color schemes). Twitter states their suite is a blend of Twitter Cards and Promoted Tweets presented as a native ad unit, giving users a non-intrusive and fluid experience. Twitter Cards is a powerful far reaching way to automatically add App Store and Google Play direct download links to tweets to drive app installs and increase engagement. This allows mobile users to instantly download and install apps from within their Twitter timeline. Barriers to your target audience for your apps are practically eliminated. What’s in Store for App Developers & Marketers? Unlike typical app stores that generate traffic and access to your app only when users decide to search for solutions for a need, app promotions are pushed directly to the users Twitter feed in a natural and targeted way. Also, along with Twitter’s announcement of their collaboration with the MoPub mobile advertising exchange, developers will have access to a marketplace that reaches over 1 Billion unique off-Twitter mobile devices. MoPub debuted in September 2013 and serves over 130 Billion ad requests via iOS and Android applications each month. This Billion strong advertising network can be accessed through ads.twitter.com and is currently in beta testing for US advertisers only. With Twitter’s knack for revolutionizing technology and garnering massive user engagement and reach, this platform is certainly expected to take off. As a developer, your ability to prepare for the very interesting times ahead of us can mean great success for your business. The clues are in the numbers as we we’re seeing a steady increase in investments in mobile app advertising over the years and a projected big jump to $45 Billion in 2016 compared to the paltry $13 Billion in 2013 as reported by Zenith Optimedia in April this year. In business, all you need to predict the movement and performance of markets is to following where the money is flowing and where the users and eyes are. This is evident in the rise of apps developed for every human need one can aspire and business apps like POS apps. 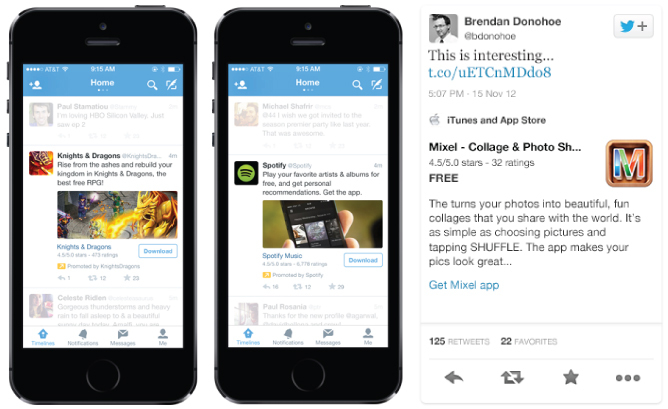 At the moment, Twitter isn’t alone in bolstering mobile ad efforts with a number of other companies following suit. Simultaneously, one of the globe’s biggest telecom companies, Telefonica, has also announced an impressive platform for mobile ad-exchange. It taps into customer demographics and uses real-time location data in order to better target mobile ads. A powerful formula for precise ad targeting leading to better performing ad campaigns and companies. It has been clear that business models based on the creation and sale of mobile apps are vastly lucrative. If you’re a traditional web developer, the time has come to consider making a serious shift into a new market and complement your current skills and practice. Your next or existing cool mobile app will be able to leverage advertising networks to drive increased sales and engagement for your work versus hoping and praying for a top spot in app stores. Your ability to reach an engaged audience will be card that makes or breaks your mobile app business.